Homemade chewy blondes mixed with creamy peanut butter and sweet chocolate chips get topped with smooth, nutty Nutella – a peanut butter and chocolate lover’s dream come true! Pre-heat oven to 350 degrees. Line an 8×8 baking dish with foil and spray with non-stick cooking spray. Set aside. Cream butter, peanut butter, and brown sugar together using the paddle attachment of a stand mixer. (Also can be done with an electric mixer.) Beat in egg and vanilla until combined. In a small bowl, whisk together flour, and baking powder. 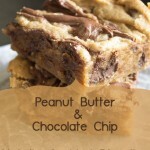 Pour into peanut butter mixture and beat until combined. Beat in chocolate chips. Pour and press mixture into prepared baking dish. Scoop Nutella into a bowl and heat in the microwave for about 30 seconds, just until warm and spreadable. Drop Nutella by spoonfuls all over the mixture. Gently use a knife to swirl the Nutella over the top. Bake for 20-25 minutes until edges are golden. Cool completely. Remove foil from baking dish, cut into squares and serve.